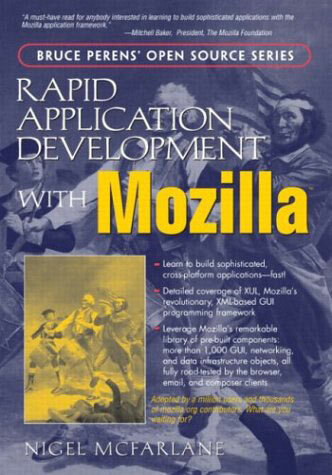 Rapid Application Development with Mozilla! Update: Nigel McFarlane passed away in late June 2005. His website has disappeared for unknown reasons. ...buy the book from Amazon!. ...check out the publisher's information about the book. A note of thanks to Jason Michaelson for reminding me about the Wayback Machine, which has an archive available of Nigel McFarlane's website. Donate to the person responsible for putting this text online. Develop some CSS styles to make the text a little prettier and submit them, or just let me know what you think of the book and the site. Begin translating the book into another language for print and online distribution, making it financially worthwhile for Nigel to have allowed his books to be put online, and, hopefully, encouraging more authors to use open-source-inspired licenses for their content. The content of this book has been updated to reflect the author's errata as of 27 October 2004, as well as fixes for six new pages of errata, mostly typographical errors. As of 6 June 2007, Seth Dillingham's errata for Rapid Application Development with Mozilla has also been integrated.